Thick riffs off AC/DC’s “Highway to Hell” reverberate through the deserted kitchen at Pier 46 Seafood in Templeton. It’s after 5 p.m. on a Sunday night, and the restaurant is technically closed. This ambiguous gray space—after the regular restaurant staff has officially left the building and before the third bottle of wine has been popped in the dining room—is where chefs Will Torres and Andrew Webber work their most explosive magic. 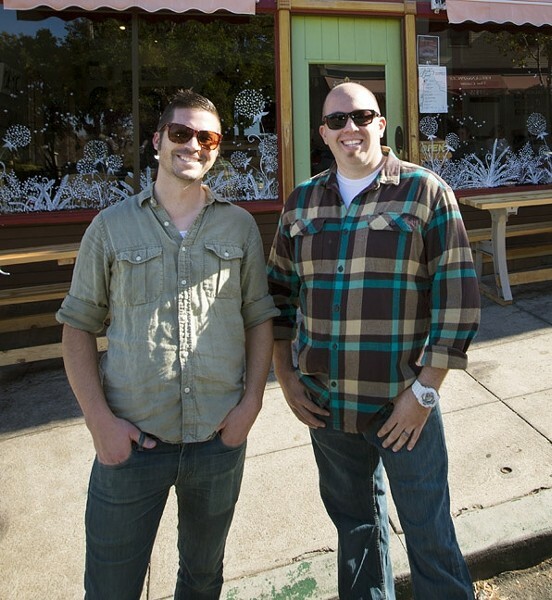 CHEF-DRIVEN FLAVORS: SLO Chefs Andrew Webber (left) and Will Torres (right), known for their day jobs at JUSTIN Winery in Paso Robles, want to make magic happen in your stomach. Their new business, Pop 46, brings inventive grub to after-hours restaurants across the county for unique dining experiences not to be missed. Stripped down from their usual starched, white culinary coats, the friends and JUSTIN Winery employees (Torres serves as executive chef and Webber works alongside him) are rocking their favorite well-worn T-shirts like badges of honor. They aren’t concerned about microgreen presentation or hastily pushing plates out; they’re simply two dudes chopping, mixing, deglazing, and—very often—cracking each other up into peals of laughter. Somewhere along the way, a chocolate beet cake with crème fraiche and citrus is made. This was the simple idea behind the duo’s new business, Pop 46, which takes over existing, after-hours restaurants and transforms them into places where inventive edible experiences unfold. The inaugural July pop-up dinner, held at Pier 46 Seafood, served 30 guests a five-course meal paired with Rotta wines. The pair’s third incarnation is slated to pop up somewhere in SLO the week of Sunday, Dec. 7, and will feature a creative dinner offering. It’s all very mysterious. “We have a lot of creative freedom in our day jobs, but Pop 46 really allows us to be more relaxed, have more fun, and present more of ‘our food’ and ‘our style,’” Torres said. “It also just feels really good to have something that is just ours,” Webber added. As for their culinary style, it’s useless to discuss. Know that you’ll get vibrant, globally influenced dishes, and that the ingredients, whenever possible, will be local. In a way, the chefs are re-creating the magic of when they first met: about three years ago at an Arroyo Grande barbecue. Naturally, Webber served juicy lamb burgers and crab guacamole. They hit it off swimmingly. Torres was so impressed with his new pal, a native Oregonian and former coffee shop owner, he had him try his hand at Paso’s JUSTIN Winery, an epicurean destination where eight-course dinners and elaborate brunches are the norm. Now, both men happily live in San Luis Obispo with wives and kids, often carpooling to work. “This” is a totally different way to dine. As a pop-up patron, not only do you have full knowledge that your chefs are having a ball while they cook your food, you also get the chance to chat them up as they personally bring the grub right to your salivating face. POP INTO FLAVOR! : For Pop 46 reservations, locations, and all the unexpected details, click over to Facebook.com/PopFortySix or contact webber.andrew@gmail.com. Still, Pop 46 is a new concept for SLO County. Not many have heard of Los Angeles radicals like Ludo Lefebvre of Ludobites and Trois Mec, or even the concept of “pop up” dining. The cost, however, is understandable: The low overhead of the pop-up concept allows the chefs leeway that brick-and-mortar restaurants just don’t, and what chef wouldn’t drool over that? “Because we’re only open for one night and the menu is completely different each time, we can be extremely creative and try things we would never be able to on a nightly basis,” Webber said, adding that, eventually, they’d like to invite other chefs to join their pop-up playtime fun. For the duo, Pop 46 magnifies the best parts about being a chef. Namely: feeding people, and maybe even making them pat their tummies in deep satisfaction. Always one to complete his buddy’s thoughts, Webber chimed in with enthusiasm.